Seattle Times travel and outdoors reporter, Crystal Paul, spent 24 hours in Vancouver and joined us for JAPANESE PROBLEM. Read about her Vancouver visit and reflections on our show here. Read the rest of Irving Chongs reflections on seeing JAPANESE PROBLEM here. Thank you Janet Smith for highlighting our return to Hastings Park this September! 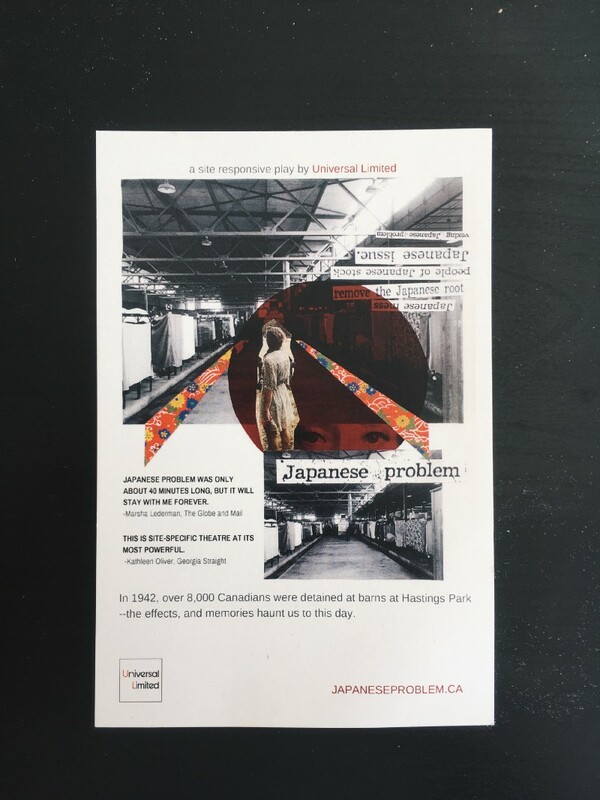 The word is out: JAPANESE PROBLEM is heading to Toronto to join Soulpepper's 2018-2019 season and we are extremely excited. Explore Soulpepper's 2018-2019 Season here. JAPANESE PROBLEM takes home Critics' Choice Innovation award at 2018 Jessie Awards! Thank you to critics Mark Robins, Jo Ledingham, Colin Thomas and the Jessies for this honour! Thank you to Kathleen Oliver and the Georgia Straight for this inspiring recap of the night! The JAPANESE PROBLEM team was thrilled to take home the Critics' Choice Innovation award along with Mind of a Snail’s Multiple Organism! Accepting one of two Critics’ Choice Innovation Awards (the other went to Mind of a Snail’s Multiple Organism) with Yoshié Bancroft for Universal Limited’s Japanese Problem, Joanna Garfinkel echoed that sentiment: “We wanted to change the stories that were told, who was in them, and who told them.” --read the full article here! We are excited to announce that JAPANESE PROBLEM was nominated for Significant Artistic Achievement and the Critic's Choice Innovation Award. Heartfelt thanks to all those who helped make our run at Hastings Park a success: our collaborators, designers, community partners, supporters, and audience members--we could not have done it without you! Thank you to The Westender and Jo Ledingham for including us in their 2017 list! Not a week went by in 2017 without something wonderful happening on a Vancouver stage. From the Goldcorp Stage to The Fishbowl, under the Bard tents or under the Cambie Bridge, there was seemingly a show on for every taste. With that, here are some productions – not necessarily the best – that creatively pushed the boundaries of live theatre this year. Japanese Problem / Chinese Problem is a piece related to JAPANESE PROBLEM & reflections on the play's role among politics of race in Vancouver. This past Sunday, our friend Erica Isomura, and author of the article, shared an excerpt at the Canadian Race Relations Foundation's panel discussion and dialogue event. The theme of the discussion was "Building Bridges Across Asian Canadian Communities." Read the excerpt here, with the full piece, a 3-part series in Schema Magazine, forthcoming in 2018. Thank you to Vancouver Presents and Mark Robins for including JAPANESE PROBLEM in their top ten list for Vancouver theatre productions in 2017! Can you guess from their image who else is on the list? See the rest of the list here! National Post article draws attention to long-lost letters, including one written by Tokuji Hirose, great-grandfather of JAPANESE PROBLEM collaborator Brent Hirose. Image from The Héritage project --a 10-year initiative to digitize and make accessible online some of Canada’s most popular archival collections encompassing roughly 40 million pages of primary-source documents. Chronicling the country and its people from the 1600s to the mid-1900s, this collection represents a vast and unique resource for Canadian historians, students, and genealogists. We are thrilled to be in good company alongside fellow theatre artist Testuro Shigematsu and his new play 1 Hour Photo. Read the whole article here. 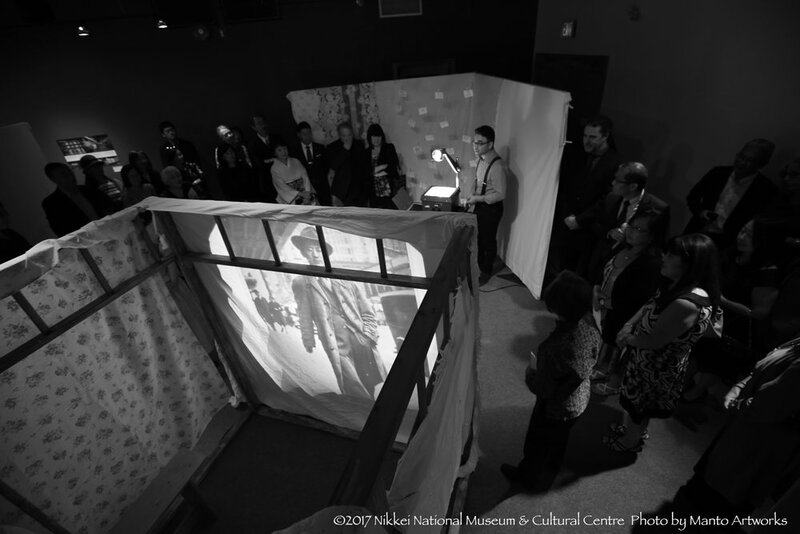 If you missed JAPANESE PROBLEM at Hastings Park, please join us at the Nikkei National Museum in Burnaby for the fall exhibit Hastings Park 1942 -- where a filmed version of JAPANESE PROBLEM will be projected hourly. Thank you to Margaret Gallagher at the CBC for coming out to chat with us during our rehearsal's in the Livestock Barn.